Stories allows you to share multiple photos and videos in a slideshow format. These photos and videos are automatically deleted after 24 hours. Unlike regular posts, there are no likes or public comments, though people can comment via direct messages if you’ve set up your account to allow that. Followers will see your Stories in the ‘Stories and Live’ bar at the top of their feed. When there's something new to see, the outline is colored red. This is another great opportunity to raise your brand awareness, potentially reaching a new audience (with the recent introduction of “hashtags Stories”) and as of May 2017, business accounts can now directly link any photos to any URL, a game changer for marketing. Stories offer the opportunity to show a more candid, behind the scenes perspective on your life/business and are a great way of bringing more personality to your brand for example, showing a fun side with a multitude of emojis, fun stickers and other constantly updated bells and whistles to play with. But if Stories gives you the opportunity to step away from the carefully curated images on your feed, you should still pay attention to your content as you want followers to come back. INSTA NINJA TIPS: Do incorporate a video, but favor photos with bold words as people tend to click through quickly. Opening someone’s Stories feed is, as Forrest Gump would say, like opening a box of chocolates; you never quite know what you’re going to get. If followers find your Stories are not that interesting, they’re unlikely to click to view the next ones. There is no limit to the number of photos and videos you can posts, though you should probably keep them at no more than 10‑12. Importantly, you should avoid repeating the same photos you have on your feed, but instead offer exclusive content like sneak peeks to an upcoming project, exclusive access to an event, etc. Boomerang — snaps a few photos in quick succession and stiches them together into a mini video that that plays forwards and backwards. Rewind — takes the video but it will then play in reverse. Handfree — allows you to record a video without having to keep your finger on the record button. Particularly useful if you want to switch between front and rear-facing while recording or are talking to camera. You can link to another account by writing its handle for example. However, you must have liked that account already, if you want the the link to work. If the handle does not have an underline (photo far right), it will not link to the account. If you hashtag a location or a keyword, as you would in the normal feed, the photo will become visible to people searching that hashtag, it also appears in the “location Stories” Instagram just launched and can be found in the general Explore tab (Insta stories by keywords will soon appear too). How to check whether your Instagram Stories are performing well? Open Your Story and swipe up on the screen. You can find how many people viewed each photo or video and see their names. This is a useful tool to help you decide how many photos you should post each time as it will show quickly (or not) people drop out of your stories. 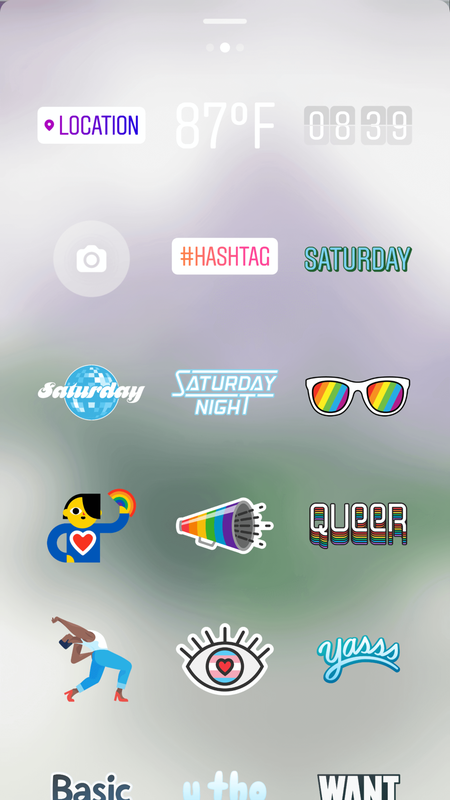 How do you keep your Instagram Stories? While Instagram Stories aims to create content that disappears after 24 hours, you can download yours to keep them: open Your Story, swipe up on the screen and click on the arrow pushing down on a tray.